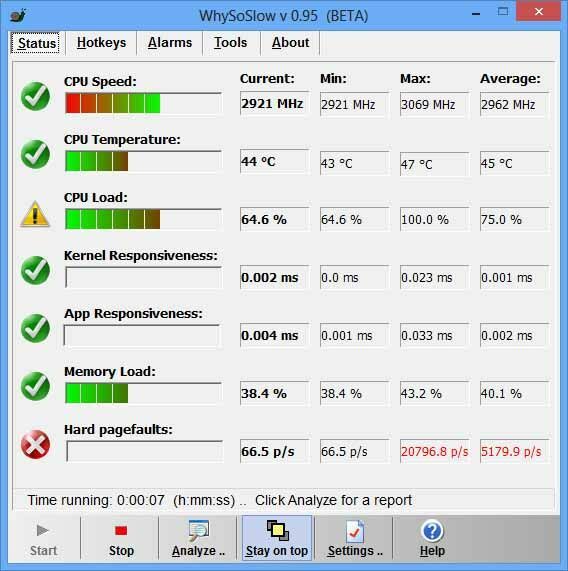 Free download WhySoSlow latest version. The software does a serious effort at analyzing your system to find out why it’s running slow… Instead of focusing on a limited set of possible factors that may slow down your computer, this software takes a holistic approach to analyzing the responsiveness and performance of a system. It’s intended as a one-stop solution for checking all perfomance health factors of a system. Among other things, the software will analyze and monitor your CPU temperature and speed, running processes, memory usage, page file usage, disk fragmentation, power settings, responsiveness behavior of BIOS, devices and drivers and several other factors that may influence the performance and responsiveness of your system. Upon request, the software will perform a thorough analysis and provide you with a detailed report that includes suggestions on how to improve your systems responsiveness and performance. WhySoSlow will allow you to configure alarms that trigger when certain criteria have been met, such as a CPU that reaches its maximum temperature or is being throttled down for too long. This will allow you to operate your system smoothly while it’s being monitored in the background by the software, consuming only a minimum of resources. The software will also include the functionality of the AntiFreeze application. This means it will include an emergency task manager for in case the system is truly unresponsive and the standard task manager cannot be executed.